I meant to get this up last night, but had some technical difficulties with Blogger. 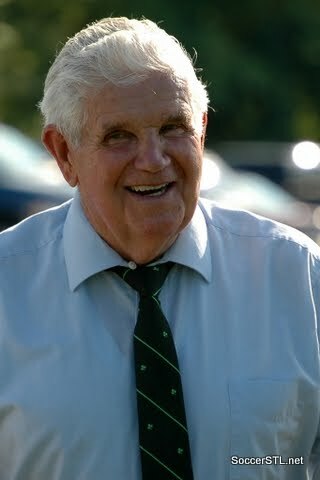 A day later, there's still a lot swirling around in my head after hearing the news that Harry Keough had passed away. Many of those swirling things are memories, which is funny because for a long time I didn't actually realize who he was. You see, for some years growing up, Harry wasn't the guy from the 1950 Belo Horizante upset to me. He wasn't Ty's dad or that great SLU coach. In fact, he wasn't even Harry by name for I don't know how long. He was just guy that seemed to be around area soccer games a lot. He was the funny ref that would gruffly explain how to avoid making the foul I'd just been whistled for, the guy who'd be seen talking to coaches a lot. If I could say one thing about good ol' Harry in the deserved precession of public mourners for his passing, it would be that he was kinda like the grandpa of St. Louis soccer to decades of kids growing up there. He may well have been the same for the adults around the game in America, I can't say. In addition to his family and friends, Harry will be missed by US Soccer and remembered as one of its truest pioneers as player, coach, whatever ya got. Most of all, though, I think he'll be sorely missed around the fields of St. Louis because he was just good ol' Harry - even if you didn't happen to know his name yet. UPDATE: I'm too dim-witted to figure out how to embed this fine St. Louis news video from last night, so here's the link.